Well, we're working on this, and so far I have a soft commitment, but I'm going to make sure we make this a done deal. Our product will look great in their magazine! Pools, Spas & Patios Magazine is part of the Kenilworth Publishing is one of Canada's leading publishers of quality trade magazines and is, in turn, owned my multinational conglomerate Forum Media Group. I think we will be featured in their HOT PRODUCTS section! I'm sending them hi-res photos of our Pool Netr™ in action and including a great write-up. The best part of all of this? 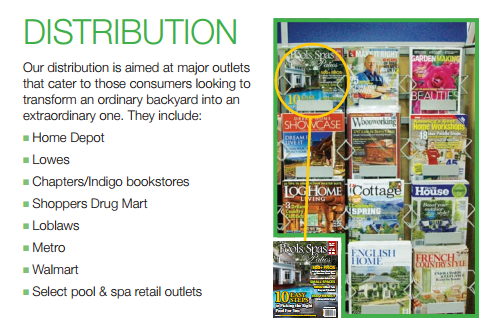 They have national distribution across all of Canada and their popular magazines are available at Lowe's, Home Depot, and Wal-Mart! This is going to be great for us! Newer PostGoing to Orlando for the Pool | Spa | Patio Expo? Here's a deal for you! Older PostThe Pool Netr Will Be Featured in TWO National Magazines!